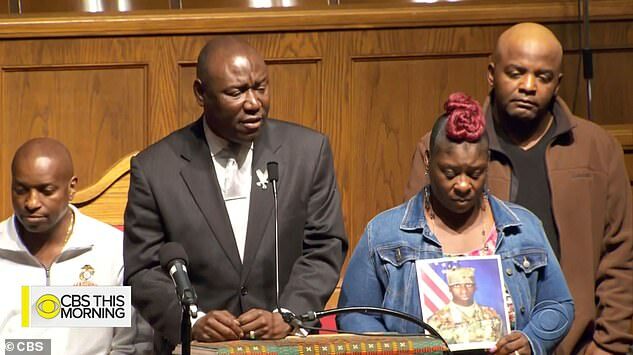 More than 1,000 people honored the life of the 21-year-old black US soldier who was shot and killed by police who wrongly identified him as the shooter in an Alabama mall. A further 120,000 more watching the service, dubbed his ‘homegoing celebration,’ over livestream. 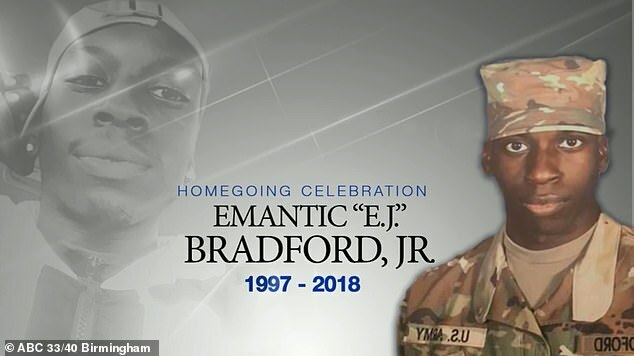 The eulogy for Emantic ‘EJ’ Bradford, Jr. was given in Birmingham on Saturday by the Reverend Jesse Jackson, who pledged to keep fighting for more information and the release of videotape of the tragic incident at Riverchase Galleria Mall on Thanksgiving. 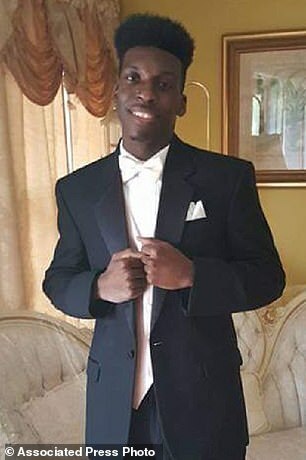 Bradford, who had a concealed weapons permit for the gun he was carrying, was killed by a Hoover police officer while trying to help when an 18-year-old man and 12-year-old female bystander were injured by gunfire in the shopping center last week. The officer who shot Bradford has been placed on leave pending the determination of an investigation, and the suspect believed to have fired the shots, Erron Martez Dequan Brown, 20, was arrested on Thursday. 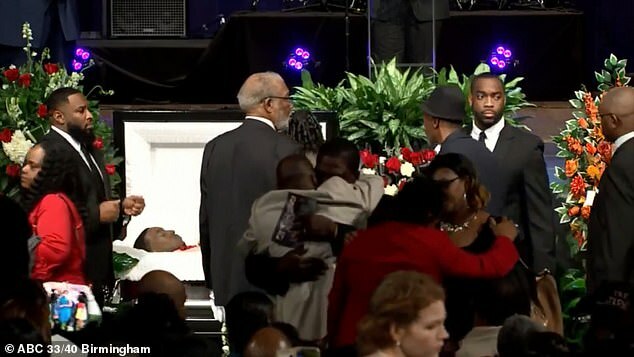 The funeral, which was broadcast over social media in real time by ABC, was held at Boutwell Auditorium, where the expansive crowd wept as they individually filed by Bradford’s open casket to pay their final respects to the beloved son and friend. 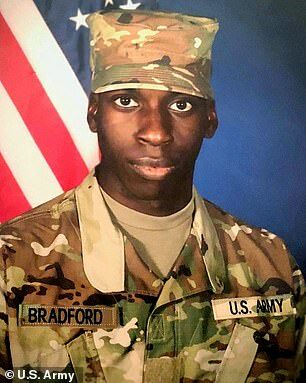 The fallen soldier’s father, Emantic Bradford, Sr, said he hadn’t realized his son had ‘touched so many lives,’ as he grew emotional at the service. Currently battling cancer, the young man’s father said his struggle had sparked growth for his son. ‘When I got sick, I knew then my son turned the corner and started being responsible,’ he said. Others said the same of the military servicemember, before Jackson gave his remarks. ‘Everybody called EJ,’ one friend said. ‘He was always on call.’ He was described as generous and loyal, and always the one to be thinking about others. When Jackson spoke, he urged to crowd to think of Bradford among not only the many minorities whose lives have been taken by law enforcement, including Michael Brown, Freddie Gray and Philando Castile, but also civil rights pioneers. He preached about the long history of civil rights in Birmingham and Alabama, and the recent Black Lives Matter movement, naming Rosa Parks, Martin Luther King Jr. and the four little girls killed in a bombing at Birmingham’s 16th Street Baptist Church. ‘In the images of those battles and the shedding of blood, E.J. Bradford joins those ranks,’ Jackson said. 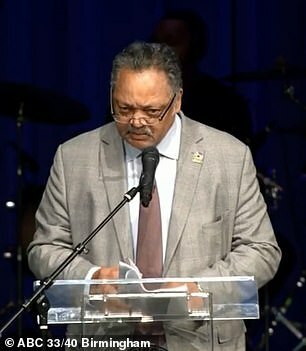 When Jackson spoke, he urged to crowd at the ‘homegoing celebration’ to think of Bradford among not only the many minorities whose lives have been taken by law enforcement, including Michael Brown, Freddie Gray and Philando Castile, but also civil rights pioneers like Rosa Parks and Martin Luther King Jr. The Hoover Police Department has turned over footage of the shooting of Bradford to the Alabama Law Enforcement Agency, which is investigating. The city has not released any information about the officers involved, but did say the person who fired the fatal shot has been placed on inactive duty during the investigation. 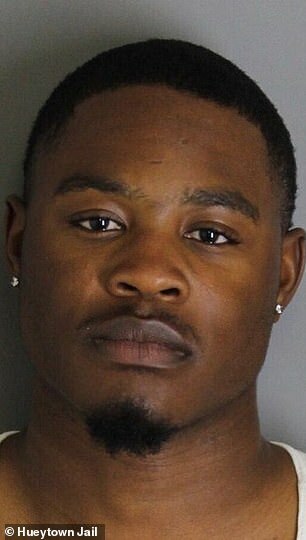 Brown, who is the man believed to have fired the shots that struck Brian Wilson and bystander Molly Davis on Thanksgiving night was arrested on Thursday,one week after the incident that resulted in police shooting and killing Bradford. 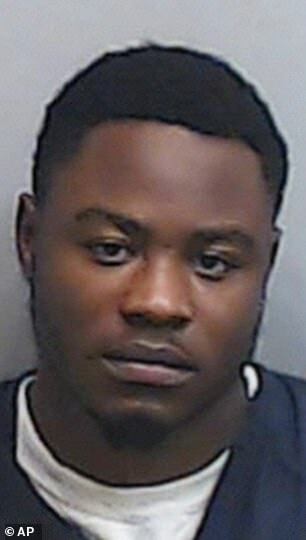 The Alabama Law Enforcement Agency says Brown of Bessemer was charged with attempted murder in the shooting of Wilson, who was a friend of Bradford’s. Wilson was shot at least one in the stomach, and taken to a nearby hospital where he remains in serious condition, according to AL.com. Davis was taken to Children’s Hospital and she has since been released. Brown was taken to the Fulton County jail for an extradition hearing to be sent back to Alabama. His bond is set at $125,000. 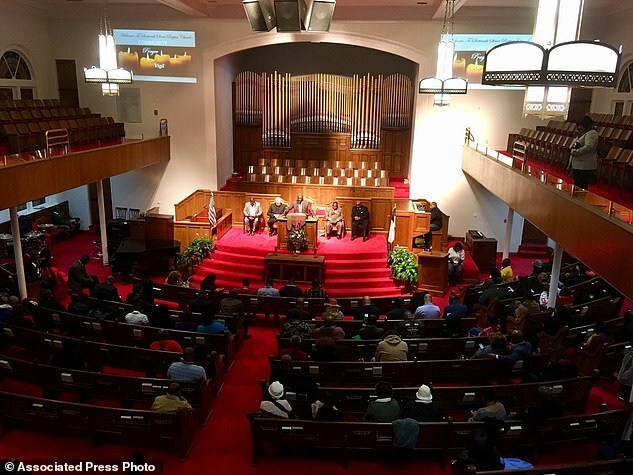 On Tuesday, around 200 people turned up for a community vigil at Sixteenth Street Baptist Church in Birmingham to show support for Bradford’s mother April Pipkins. 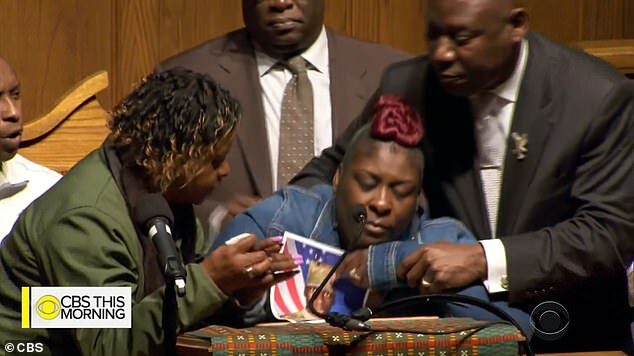 The distraught parent received a standing ovation but collapsed at the civil rights landmark, still in disbelief her son died on Thanksgiving Day, and was taken to a hospital. Like many others, Pipkins believes Bradford was gunned down without a second thought simply because of the color of his skin. 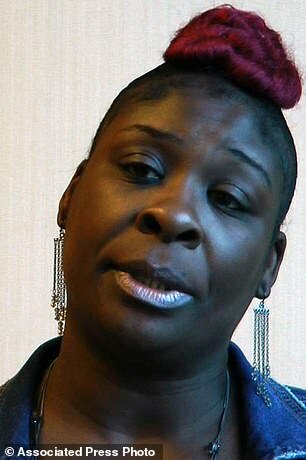 She had previously said ‘the whole scenario would have played out differently’ with Hoover police if her son were white. Witness reactions from the horrifying night reveal those who saw the incident take place immediately commented on Bradford’s innocence. ‘They just killed that man in cold blood. They just seen that man had a gun on him. They shot that man down for no reason,’ someone in a video posted by Noland Moore on social media can be heard saying in the clip. The person added, ‘The police see that boy had a gun. He probably got a gun license and everything. The family’s lawyer said that despite talk that more Americans should be armed to ensure their safety, this incident proves that’s not the case. ‘There’s some suggestion… that to stop the bad guys with guns we need to have the good guys with guns. Well, EJ Bradford was a good guy with a gun,’ Benjamin Crump said. The lawyer said witnesses had contacted his law firm saying Bradford was trying to wave people away from the shooting. Pipkins described her son as a loving, friendly young man, saying he had gone to the mall with friends on Thanksgiving evening. She said the officer ‘should be punished for what he did’ after her son was killed last Thursday. Pipkins said she did not find out what happened to her son until Friday morning when she returned a call from one of his friends who had tried to reach her during the night. ‘I can’t get it out of my head. I cannot get the scene out of my head of my child laying there, nobody around him trying to help him, just laying like a piece of trash where everyone can walk around and parade and post pictures of him on social media,’ she said. Speaking from the pulpit on Tuesday, regional NAACP field director Kevin Myles said Bradford’s killing was part of a pattern of police killing black men without cause. ‘This is our personal Katrina. The helicopters are not coming, nobody is coming to bring us water. If we are to be saved we will save ourselves,’ he said, in an analogy to the devastating hurricane of 2005. Bradford was born on June 18, 1997 in Birmingham, Alabama at Montclair Hospital. 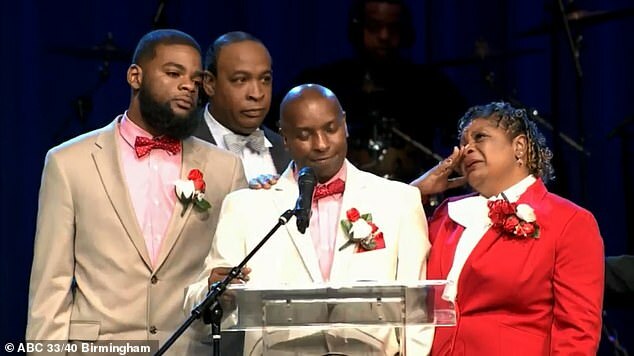 He leaves behind to cherish his memories his loving mother April Monique Pipkins and devoted father Emanitc Fitzgerald Bradford, Sr. (Cynthia) of Birmingham, Alabama, as well as three brothers, Andrew Bradford of Atlanta, GA; Khalil Pipkins, and Cle’Mon Brown both of Birmingham. He’s also survied by his grandmothers, Althea Pipkins of Birmingham and Charlie Mae Bradford of Washington, DC, along with his grandfathers, Ernest Batie of Mulga, Alabama; Leon Douglas (Mamie) of Montgomery, Alabama; and one nephew, Anthony Bradford of Atlanta, as well as a dedicated uncle Anthony Thomas of Birmingham, and a host of other uncles, cousins, family and friends.